helping partners secure funding for implementation of sub-watershed projects that target technical assistance and funding to land within the watershed to maximize water quality improvements and reduce the impact of flooding. 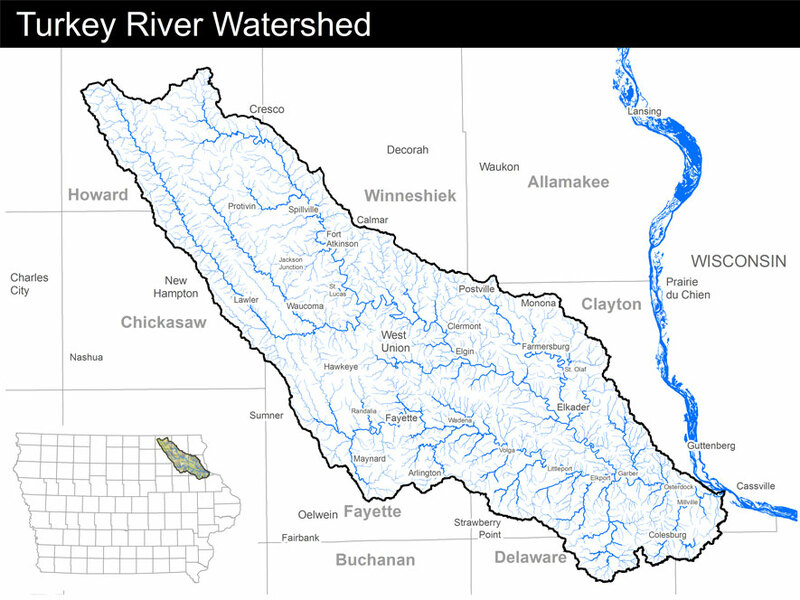 The project is modeled after the successful 640,000 acre Upper Iowa River Watershed (UIRW) Project, which was coordinated by Northeast Iowa RC&D, brought together dozens of partners and secured millions of dollars for private lands conservation in the UIRW. No matter where you are, you’re in a watershed. We all live in a watershed—the geographical area that drains to a common waterway, such as a river, stream, or lake. Watersheds come in all shapes and sizes: the Turkey River watershed is over 1 million acres in size, the Dibble Creek Watershed that empties into the Turkey River near Clermont is about 12,000 acres, and the water that falls on your house and lawn becomes part of your watershed too. Watersheds cross town, county, state, and national boundaries. 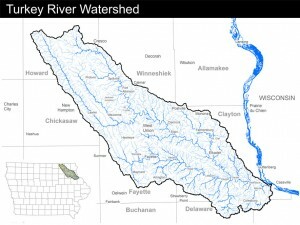 The Turkey River watershed includes the communities of Arlington, Calmar, Castalia, Clayton Center, Clermont, Colesburg, Cresco, Douglass (Auburn), Edgewood, Eldorado, Elgin, Elkader, Elkport, Farmersburg, Fayette, Festina, Fort Atkinson, Garber, Garnavillo, Greeley, Gunder, Hawkeye, Jackson Junction, Lawler, Littleport, Luana, Luxemburg, Maynard, Millville, Monona, Motor, Osborn, Ossian, Osterdock, Postville, Protivin, Randalia, Ridgeway, Spillville, St. Lucas, St. Olaf, Strawberry Point, Volga, Wadena, Waucoma, and West Union. As of the 2010 Census, approximately 32,100 people are living within the Turkey River Watershed.